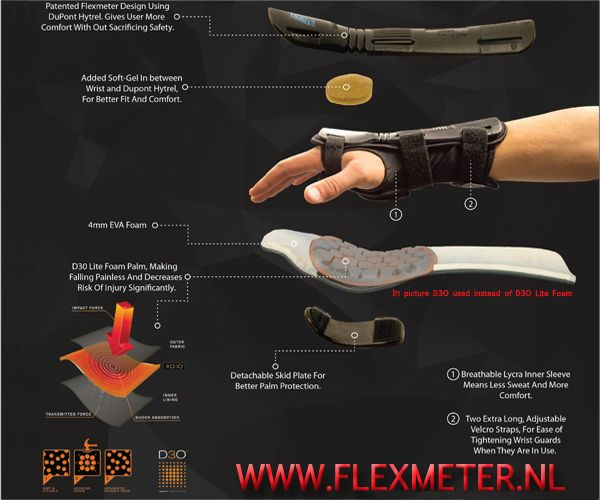 Flexmeter Plus D3O wrist protector with two protectors 1 up the hand with the Hytrel material flexible high quality protection equipment and one protector under the hand of the protector in which the smart d3o material. D3o is smart material it captures the force of the crash immediately around the protector and stiffened. When the crash is gone the D3O material is soft again. Flexmeter is developed based on accidents while snowboarding. 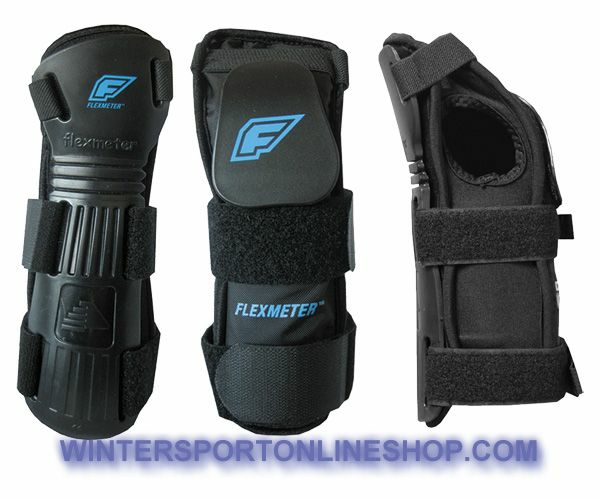 In 2003 was the Flexmeter Wristguard ISPO Brand New Award Winner. Flexmeter D3O Plus comes with the palm protector that is for only for skating, skate and board sports like longboard. 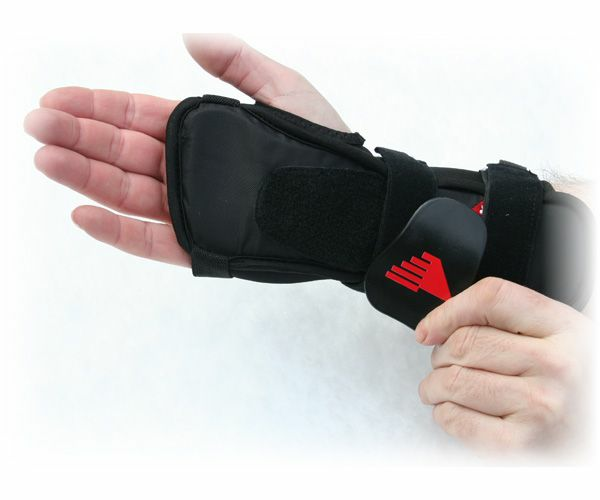 When you go snowboarding you remove the palm protector off, the high-quality Velcro makes it easy to put it on again. 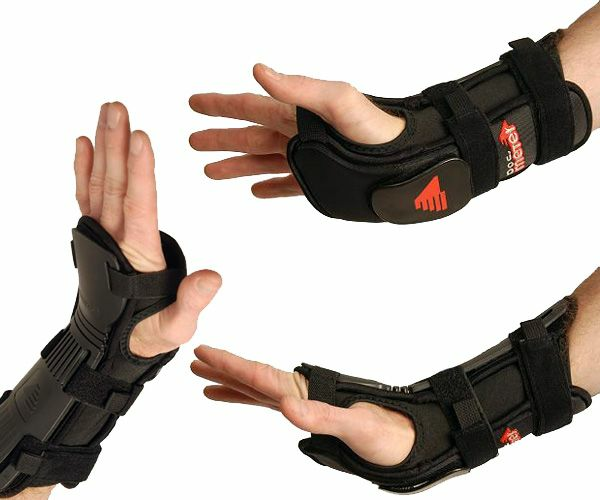 On Hand Knuckles soft foam about the Flexmeter protector, both protectors are flexible which allows a certain movement. A protector does its job best when it is properly fitted, with 2 adjustable Velcro straps Flexmeter Plus d3o is properly fitted to wear on hand. Flexmeter D3O Plus does not fit under your snowboard gloves, unless you have two fingers thick space left over in the gloves. Flexmeter Single fits under most Snowboard Gloves. We also sell special Snowboard Ski gloves and mittens for over the Flexmeter. See the next tab forthe sizes!